In this workshop we read geometry, cut it in half to take advantage of symmetry, suppress unneeded features, split surfaces for load application, and transfer the model into ANSYS Mechanical for later analysis. In this workshop we create planes a couple of different ways to explain location and orientation of sketch planes (which may later be used as coordinate systems in Mechanical). In this workshop we demonstrate the need for the freeze/unfreeze functionality while simplifying the assembly through feature suppression and sketching. Brief workshop that covers transferring coordinate systems to Mechanical and later used as reference for a point mass. The workshop demonstrates the large advantage of using brick elements over tetrahedron elements for large models. The node count can be drastically reduced to save on disk space and solve time when switching from tetrahedrons to bricks.. These three workshops demonstrate different techniques for slicing geometry within DesignModeler to get the desirable brick elements. These do not have specific instructor demonstrations to go with them, but, they allow the students to work through them to develop expertise at the procedure. In this workshop we read a SAT file into DesignModeler, which produces a static model without parameters or intelligence. 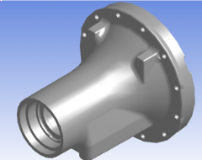 We use DesignModeler to convert the portion of the model to be optimized into parametric geometry. In Mechanical we perform analysis and manual design optimization using the newly created parameters. The students then perform a ‘what-if’ series of simulations using the Design of Experiments capability of Workbench. In this workshop we take a full 360 degree model and extract the 2D surface such that it lies in the correct X-Y plane orientation for subsequent 2D axisymmetric analysis in Mechanical. This workshop extracts a 3D fluid domain from pre-existing geometry using the 'Fill' tool and boolean operations. A first introduction to creating surface geometry in DesignModeler, this workshop shows students how to extract mid-surfaces and create Surface Extensions to tie this three part assembly together, without the need for contact regions in Mechanical. We show the students how to take a sheet metal assembly that may have previously been connected with an older beam spider method and demonstrate using Surface Extensions and Mid-Surfacing in DesignModeler to tie the parts together without needing beam spiders. The Surface Extension method creates physical geometry in the Mechanical model. Following the previous two workshops, we extract surface geometry from solid geometry, demonstrate creating stitch welds between a support tube and the platform, and set up a surface for load application that we can parameterize. We then set up the analysis in Mechanical and solve the model. This workshop leads the user through creating a model from scratch and getting familiar with the sketcher. It could be the first workshop to do for those students who do not have access to CAD at their company. This workshop creates geometry from scratch in DesignModeler using a variety of modeling and sketching features to build the user's experience level. In this workshop, we create a flight simulator base from scratch, using line body geometry and cross sections assigned to the various parts in the model within DesignModeler. We transfer the geometry into Mechanical, where it meshes line body geometry with beam elements. Post-processing is then carried out after the model solves, exposing students to the Beam Tool result object. In this workshop we create a tank with doubler plates and reinforcing ring from scratch.